Eighty one suspects, including 10 personnel who had allegedly created communal disharmony using social media, had been arrested by the Police so far over violent incidents in Kandy. 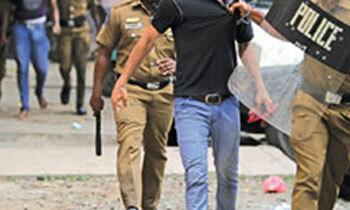 Police Spokesman SP Ruwan Gunasekera said the 10 suspects were arrested by the Terrorism Investigation Division (TID). He said 71 suspects were arrested on charges of violent incidents, while four were arrested for violating the curfew. “Those who violated the curfew were remanded till March 21 by the Kandy Magistrate’s Court. The other suspects are being interrogated and action against them would be taken under the rules and regulations of state of emergency,” he told a news briefing. Two people were killed in the violence, while 11 had sustained injuries. Well said. But also note that when ever we tried to create a strong national economy foreign forces had meddled and got rid of such governments. We should at-least focus on a strong national economy. @Janith, When the hell did we ever tried to create a strong economy. Since independence we've always been dependent on foreign handouts and loans. We never had in our history that a single person is charged and punished for these acts.Until this happens, these things will continue When there was a riots in UK, police hunted every single person and charged them.Can't imagine that will happen in SL!! OK...... HAVE THEY BEEN ON FACE BOOK. The culprits found guilty should be punished and kept in jail for a very long time for destroying the good reputation of our peaceful nation. What nonsense, they will be released in exactly a few weeks when all things die down. This is a country full of impunity. BuffoloaCitizen are you even in Sri Lanka? Its people like you who's creating violence in this country while being abroad. I've seen several similar comments of yours. Citizen - truth is bitter. They all will be released soon. Because our most of the judges and lawyers are from SRILANKAN LAW COLLEGE where people get admisson without proper knowledge. Most of them did not get good marks in Ordinary level or Advanced level . Well done SL Police.Good move. It is very easy assume things. It is assumptions and grapevine that caused this havoc in the first place.